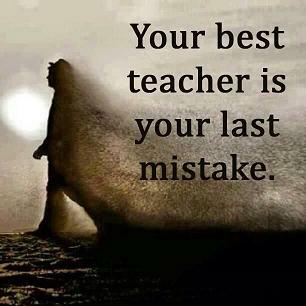 The biggest mistake that you can make is to avoid mistakes. It’s considered a fatal error attempting to do things right the first time, or be too scared to try. Mistakes are happenstance. In the impulse economy that we live in, if you don’t fail, you’re not trying hard enough. The only ones who don’t make mistakes are those who are timidly living out their lives without taking risks without novelty, and not progressing forward. If you can’t find the strength to accommodate yourself to invite failure, then you can’t succeed in the long run. The reason being that by making mistakes, doing so has proven to be the key when it comes to innovation. Calculated and regulated mistakes by trial and error, by taking a risk, beats perfection every time. It’s shown that the best solution isn’t always the obvious. Making mistakes is the gateway of discovery and solvency. Rare are those times when you learn by doing something right the first time. Visionaries consider mistakes as a learning process, that the road to success is constructed with bridges of failure. The sooner that you make them, and then correct and work through them, the faster that you’ll find out what works. Never prolong the agony, scared to do something because you don’t want to make mistakes, to fail. Get over them quickly, learn the most that you can from them, and then reconstruct. Learn to fail faster so you could succeed quicker. Scientists, innovators, idealists, all have created their legacy by being wrong, to make mistakes, usually in big and expensive ways. Famous inventors actually looked forward to making as many mistakes as possible. Every great leader in their industry has a long history of failing. The failed light bulbs, the failed combustion engines, the failed computers, are all proof, evidence that what failure breeds is innovation rather than discouragement. Not all business failure are glorious. Over 90% percent of new startups fail, vanish without a trace within the first few years, while almost all of them are gone within ten years, this because they fail to innovate. The economy revolves around renovation. Doing things wrong is usually a prerequisite before doing things right. If people didn’t do or try stupid and ridiculous things, then nothing that’s intelligent would ever be developed. The majority of the “old economy” managers want is to take their time, this to make sure that everything is thought out and planned, that all the “i’s” are dotted and all the “t’s” crossed. But this is no longer the case or viable, as most no longer have that luxury. It’s not recommended to slow down or defeat yourself in the development cycle, as speed to market is now the key. Fail, find out its faults, and then reset and repair as quickly as possible. The idea is to discover and then turn them over as rapidly as possible, this regardless of how painful or expensive it may be. The new innovators encourage making mistakes. There are now some companies which even rewards the best mistakes. So offer a bonus for the most brilliant or flagrant fractured idea. There are far too many companies who claim that they encourage or expect mistakes, but in reality, they intimidate or punish them. Instead, train them to savor their mistakes, while precisely documenting the path that got them there. Although prototype may sound like a highly industrial term, what it simply means is doing things as quickly as possible without attempting to get them into their final form, while expecting to make mistakes and then swiftly fixing them. When things do go wrong, never go searching for those who made the mistake, never cast blame. One reason why mistakes go undetected is that those who made them don’t wanted to be accused for their errors. So instead, they’d rather hide or deny them. Whenever any project steers off course, treat it like a revolution. This instead of wasting time and energy finding out who did what or did wrong. Solve the problem and get yourself back on track. Realize that mistakes are part of the process, and there should be no repercussions or admission of guilt. Create a team of learners, those who’ll oblige to a policy of never pointing fingers. Realize that there are more funnels leading to mistakes than there are solutions. Learn from mistakes, debrief everything, whether it be good, bad or indifferent. Use the following steps to dissolve any mistake: Find what works, what didn’t work, what the mistakes were, and what you’ll do next. One method of getting things moving on a project is by declaring a “state of emergency.” What emergencies do is they activate people, bringing out the do whatever-it-takes attitude, this especially once they understand that making mistakes are part of the process and a team effort. You can’t afford to be perfect. Think of the 80/20 rule, or refine it to 90/10. Establish a level of quality which goes beyond making “mistakes,” and make it a viable economic business model. Unless the outcome impacts life or death, the cost of perfection can’t be justified. Use the mistakes that you’ve generated as opportunities to improve the process. Always keep in mind that the hallmark of making progress is by making mistakes and then refining them.